"Web Conceptions and their local partner here in Germany, Webdesign Dienst, did a fantastic job to rejuvenate our website Sekem-Reisen.de in every regard: design, structure, readability on all hardware devices, including a clever CMS, which allows us to update important details of our travel offers. Web Conceptions and team took us along the tricky ways of web design, showing us all that is possible, with step-by-step guidance. We never felt lost, and if so, we told them, and they calmly and relentlessly helped us back on the right track. Michael and the entire team are not only professional in their field, but also encouraging teachers for people from other professional fields outside web development and IT, like myself. I whole-heartedly recommend Web Conceptions + Webdesign Dienst and the way they work without any hesitation to all who are in need of a perfectly looking and functional website." Web Conceptions partnered with Webdesign-Dienst Überlingen (German local representative) to create this website project and new online branding task. Together with the client, our team was involved with discussing and brainstorming for a proposed solution that would enhance the tour company's online presence and credibility, and drive new interest about Sekem, as well as enquiries for travelling to experience the project first-hand, plus add-on vacations to other parts of Egypt. Our team travelled to Germany on multiple occasions to meet with the client and our local partner to work more personally on the project - such as during the initial discussion phase, development/pre-launch, and then post launch, together with close dealings remotely throughout the various phases. 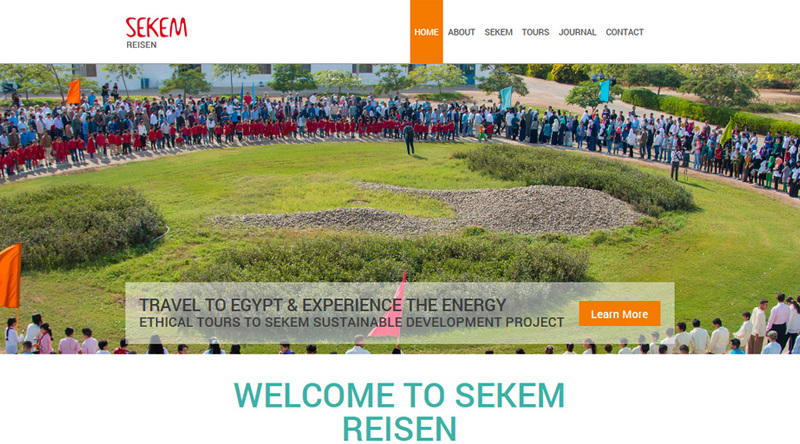 The overall idea was to create a new website that better promoted tours to the Sekem sustainable development project in Egypt, to markets such as Germany, Austria and Switzerland, as well as other European countries, namely the Netherlands, Scandinavian countries, the UK, France, Belgium, and Spain. A new, interesting and dynamic website, that is easy and exciting to navigate and explore, with rich content and information about the Sekem project and travel/vacation options to Egypt, bilingual (German and English), and powerful in organic Search Engine Optimisation (SEO) for both English and German searches. At the same time, ensuring some level of continuity in branding, so as to maintain the tour company's existing awareness and familiarity gained from the old website. This website is sure to boost Sekem Reisen's awareness in its respective target markets, especially Germany, Austria and Switzerland. It is also sure to boost the general exposure of the unique Sekem sustainable development project in Egypt to these markets, and to the wider European and global community. Backed by over 15 years' experience and know-how in web design, development, IT, SEO and marketing communications, this new Sekem-Reisen.de website is a great example of Web Conception's professionalism, creativity, and online business-aptitude, easily and efficiently working with clients in different countries across the EU-Europe, as well as globally.